Ariel Peguero held an award in one hand and a certificate of recognition in the other. He smiled at flashing cameras as guests snapped photos and recorded his big moment. Peguero was the only award recipient at the Banilejos Unidos en el Exterior’s 2018 dinner gala. The Dedham businessman was recognized by the City of Boston and the Banilejo community for his financial contributions. 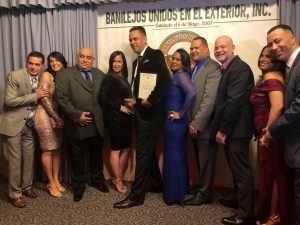 The foundation, Banilejos Unidos en el Exterior, hosted the annual gala on Saturday, November 17th, inviting Bani people from across the greater Boston area. The celebration honors the people and traditions from the Bani neighborhood back in the Dominican Republic. Popular Dominican dishes, like plantain casserole, were served as the well-known San Cristobal band, La Santa Cecilia, played music on stage. City Councilor Matt O’Malley arrived at Moseley’s on the Charles, to personally congratulate Peguero for his achievements. Councilor O’Malley introduced himself to the audience in both English and Spanish, rallying guests with a passionate fist in the air, and saying he too is a Banilejo. He presented Peguero with a certificate acknowledging his commitment and dedication to the Bani community in the city of Boston. Alongside the two, stood the foundation’s first-year president, Luis Franjul, and the gala’s announcer and host, Luisa Vargas. The local businessman operates in areas including construction, commercial residential, janitorial work and maintenance. He owns three different companies and employs around 350 people. The award recipient felt proud for the honor and hopes he can inspire young people to make a difference. “I’ve been helping a lot of employees. I always, you know, be present of donations, and any contributions. I always help,” expressed Peguero.